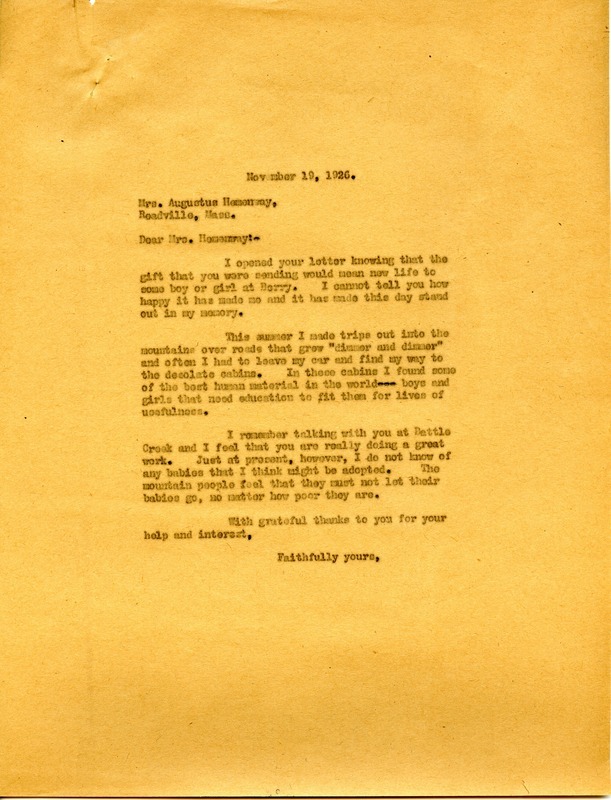 Letter to Mrs. Augustus Hemenway from Martha Berry thanking her for her gift that would "bring new life to some boy or girl at Berry." Miss Berry informs her that in the summer she made trips out to the desolate cabins to find boys and girls in need of an education. However, Miss Berry informs her that she found no babies that Mrs. Hemenway could be of service to with her work at Bettle Creek. Miss Berry informs her that the people felt that they should hold onto their babies, no matter how poor they are. Martha Berry, “Letter to Mrs. Augustus Hemenway from Martha Berry.” Martha Berry Digital Archive. Eds. Schlitz, Stephanie A., Jessica Hornbuckle, Haley Fortune , et al. Mount Berry: Berry College, 2011. accessed April 24, 2019, https://mbda.berry.edu/items/show/267.